Pavers Power Tools - Tile Tech Inc.
Power tools have taken over the building industry over the last 40 years. This is quite understandable, for they have cut down the hard labor and work time for builders. So they can get more done in the same amount of time. Power tools are faster and at the same time produce quite neat finishes. Depending on the material being used, hand tools can help to trim pavers that have been cut with power tools. 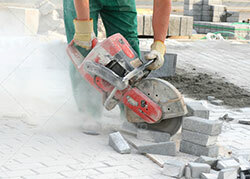 Therefore, power tools can take care of the major jobs, like cutting and splitting large paver units, while hand tools finish the jobs off by trimming edges. There are two main types of power tools used for the cutting and trimming of paver units, they are Saws and Splitters. There are many types of power saws used for cutting pavers in the building industry. There are floor saws, table saws, bench saws and the cut-off saw. Today, the cut-off saw is the most widely used type of powered saw. It is hand-held and can be used to cut pavers. Its other applications include cutting various materials; for instance, steel, clay, bricks, masonry, pipes, blocks and asphalt. This powered hand-held saw can be powered by electricity or petrol. However, it seems that the electric models are the most common in the trade. The important factor about the power saws is the blades that you choose. The blades need to be right for the type of material being cut. There are abrasive and diamond cut blades for cutting paver stones and concrete. The most popular blade is the diamond cut blade, for they last longer and cut at a consistent depth. Splitters come in an array of sizes and are used to cut various types of stone and concrete. There are block and slab splitters, both used widely in the building industry. Block and slab splitters are proving to be easy to use and very safe little machines. There are no moving parts, thus making them safe to work with. Safety is always an attractive feature, particularly in the construction field. MANUALLY OPERATED: used for regular pavers. MANUALLY OPERATED/WITH TOOTH-LIKE BLADES: used for irregular pavers. HYDRAULIC OPERATED: used for large, thick paving materials. The most popular powered splitter is the manually operated one, which is ideal for regular and smooth finish pavers.